A talking clock. And so much more. It's a clock. It's a calendar. And it's so much more! Say the Time will help you to manage your time better than ever before — you'll wonder how you ever managed without it. Download Now! Try it free for 30 days. Version 11. Designed for Windows 10, Windows 8 and Windows 7. Create fully customizable reminders for birthdays, meetings, events, TV shows, online sales, and even just taking out the trash. 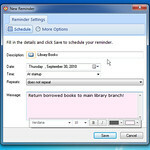 Easily schedule reminders one time or have them recur automatically. Create beautiful sticky notes to quickly jot down thoughts, ideas and other important information. Just as easy to use as paper Post-it® notes. And they're right on your computer's desktop! Say the Time's namesake feature! Enjoy periodic spoken date and time announcements in a pleasant female or male voice. 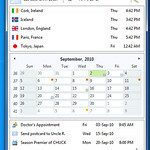 Click on your taskbar clock to view your upcoming schedule, a month-view calendar, the local time in your favorite places, and even the weather! 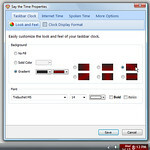 Choose your own colors, textures, fonts, and more, to give your clock your own personality! Plus, display both the date as well as the time, in any format you like. 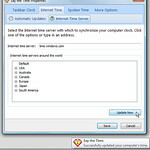 Internet Time Synchronization: Easily ensure that your computer's clock is always accurate. 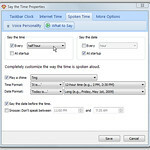 World Time Clock: Quick access to local times in all your favorite and important places around. Say the Time in action.